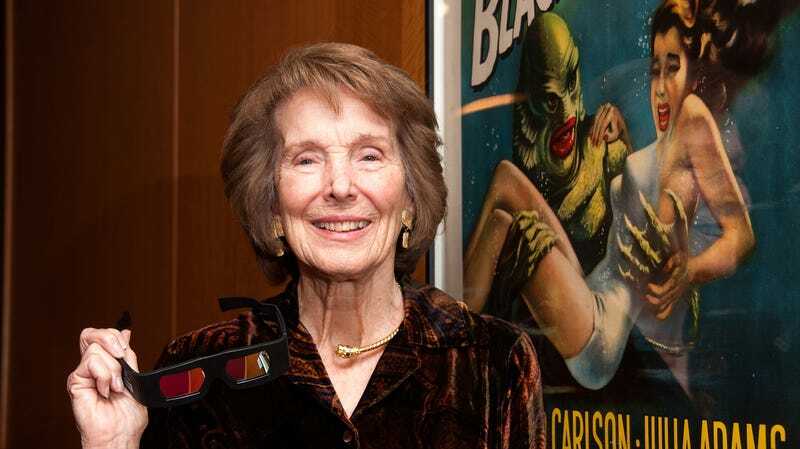 As reported by Variety, prolific ‘50s film star Julie Adams—best known for her starring role in the iconic monster movie Creature From The Black Lagoon—has died. The news was confirmed on Adams’ website, saying she died on Sunday, but a cause of death has not been given. Adams was 92. Born in Iowa in 1926, Adams moved to California and began taking acting lessons as a young woman while working as a secretary. She appeared in dozens of films in the late-’40s and through the ‘50s, beginning with a small role in Red, Hot And Blue in 1949, and she later acted in in Crooked River, Hollywood Story, Finders Keepers, The Man From The Alamo, Horizons West and a bunch of others all before she landed her breakout role as Kay Lawrence in Creature From The Black Lagoon. She continued to work consistently for the next few decades, working with Elvis Presley in 1965's Tickle Me and also appearing alongside other big-name stars like Dennis Hopper and Jimmy Stewart in subsequent film roles like The Last Movie, Bend In The River, The Private War Of Major Benson, and Mississippi Gambler. She also eventually transitioned into primarily doing TV work, playing a recurring character on Murder, She Wrote and appearing on CSI: New York, The Andy Griffith Show, General Hospital, and Beverly Hills, 90210. Adams is survived by two sons and four grandchildren.